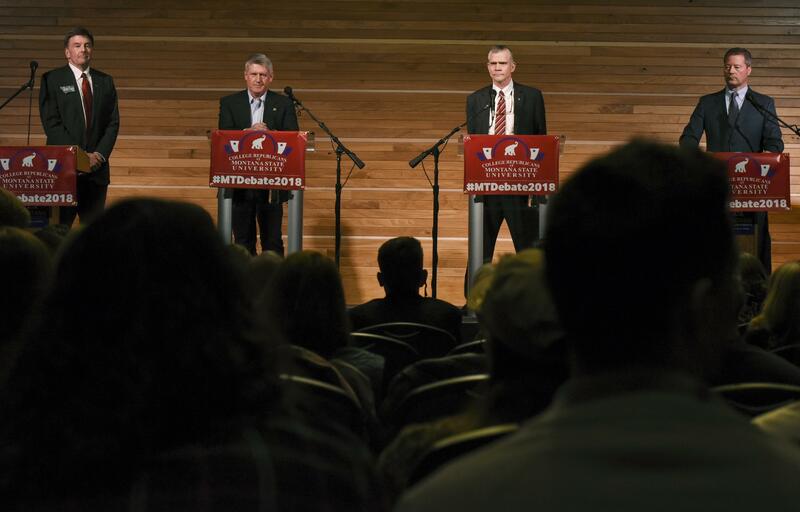 BILLINGS – Outside money is pouring into Montana’s U.S. Senate race even before Republicans settle on a nominee to challenge Democratic Sen. Jon Tester, who has become a leading target of the GOP after drawing the fury of President Donald Trump. Four Republicans are jockeying for a last-minute advantage ahead of the June 5 primary. Their ambitions to topple the two-term incumbent were buoyed after Trump – who won in Montana by 20 percentage points – unloaded on Tester for releasing allegations that the president’s pick for head of the Department of Veterans Affairs loosely handed out prescription drugs and got drunk on duty. Among Tester’s would-be challengers, state auditor Matt Rosendale has emerged as the favorite of deep-pocketed conservative donors. Outside groups including two bankrolled by Illinois billionaire Richard Uihlein have spent $1.8 million pumping Rosendale’s candidacy. That’s almost twice as much as he’s raised himself. It’s opened Rosendale to attacks from his opponents who charge he’s now beholden to special interests outside Montana. Yet it also has allowed Rosendale, the only candidate to hold statewide office, to claim a mantle of legitimacy with major Republican donors. He said that’s crucial if the GOP hopes to counter the huge amounts of campaign cash Tester has amassed ahead of November’s general election. Retired state Judge Russ Fagg of Billings has sought to counter Rosendale’s outside help with ads suggesting Rosendale, a Catholic who opposes the death penalty, would go easy on “illegal immigrants who commit murder.” Rosendale’s backers at the conservative Club for Growth have responded by spending almost $900,000 through last week with ads pounding Fagg for allegedly favoring defendants over victims while on the bench. Fagg also says he’s more willing than his opponents to part from Trump, in particular on possible trade tariffs he warns could draw a backlash against Montana’s important agriculture industry. “I’ll disagree with this president when it’s not in Montana’s best interest,” he said. Olszewski described Rosendale as “bought and paid for” given the outside spending on his behalf. He said Fagg’s willingness to run attack ads, criticized by some for perpetuating immigrant stereotypes, reflects poorly on the former judge. Big Sky businessman Troy Downing, a political newcomer, has tried to stay above the fray by largely refraining from criticism of his primary opponents and limiting his takedowns to Tester. He’s spent at least $1 million of his own money promoting himself as the most Trump-like of the four – a successful businessman who’s never served in public office. Downing has been dogged by a pending criminal case against him: Montana game officials say he bought in-state hunting and fishing licenses during years he was living in California. Downing denies the charges and delayed his trial until after the primary. Downing is an Afghanistan combat veteran, which he said gives him a close connection with a constituency that’s long been courted by Tester, the ranking Democrat on the Veteran Affairs Committee. After Trump’s attempt to shame Tester over Veteran Affairs nominee Larry Jackson, two Democratic political action committee, or SuperPacs, spent more than $1 million in ads promoting Tester’s record of support for veterans. Republican SuperPACs have spent $410,000 in recent months opposing Tester. “No matter how he (Tester) is trying or not trying, it’s not trickling down and actually improving the veteran experience in the state,” Downing said. Published: May 28, 2018, 4:44 p.m. Updated: May 28, 2018, 9:19 p.m.